January 20 is the anniversary of the freedom of the last group of political prisoners in Iran under the Shah’s dictatorship in 1979. This is the day when the motto of “free all political prisoners” became a reality. This was one of the main slogans chanted in popular demonstrations and uprisings under the Shah. The last group of political prisoners incarcerated by the Shah’s regime included two of the most prominent and well-known political prisoners of the time, Massoud Rajavi and Moussa Khiabani. 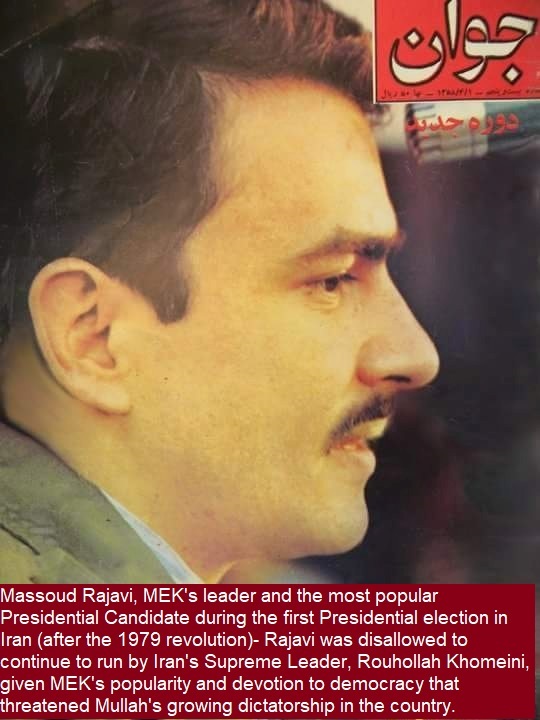 the remaining leadership of the People’s Mojahedin Organization of Iran- PMOI (MEK) at the time. Those were the days when nationwide popular uprisings against the Shah had broken the spell of repression, and under the public opinion pressure from inside Iran and abroad, the Shah’s dictatorship had been forced to free the last group of political prisoners on the night of January 20, 1979, just three weeks before the fall of the Shah who had fled the country only four days earlier on January 16. In preparation for their freedom, the last group of political prisoners had already been transferred from the Evin Prison to the Qasr Prison in downtown Tehran. People had been gathering for days outside the Qasr Prison demanding their freedom. With the flight of the Shah, the last obstacle for their freedom was gone. The Shah later wrote in his memoirs that his greatest mistake was releasing the terrorists [reference to political prisoners] from jail. One of the great concerns in those days was for the safety of the prisoners who had been held until the last minutes by the Shah’s regime. People feared that the Shah’s secret police, SAVAK, would stage-manage their murders. The interrogators of the Evin Prison had a record of feeding cyanide to a number of prisoners and killing them. In another incident on April 19, 1975, the SAVAK set up Bijan Jazani, six of his comrades, and two PMOI members –Kazem Zolanvar and Mostafa Javan Khoshdel—on the hills of Evin and shot them in the back, claiming that they had tried to escape. On the night of January 20, 1979, people from Tehran and other cities had gathered outside the Qasr Prison waiting for hours, demanding the immediate release of all the remaining political prisoners. On the other hand, the families of MEK and Fedaii prisoners and other groups of people had been staging a sit-in outside the Justice Ministry in Tehran since a week before, demanding freedom of the last group of political prisoners. Meanwhile, the regime had declared a state of emergency (curfew). Nobody was allowed to move around the city after 9 p.m. They warned the gathering of people outside the Qasr Prison, firing shots into the air to disperse them. Their threats were not heeded. Angry people clenched their fists and spoke out about their intention to bring down the walls of the prison to free the political prisoners. Their persistence finally bore fruit and forced the authorities to back down. Eyewitnesses say that almost two hours before the state of emergency, the Shah’s generals and prison officials went to one of the wards and hastily took away Massoud Rajavi. 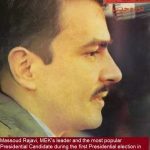 The measure worried other prisoners in the ward before it became clear that they had taken Massoud Rajavi to the prison’s balcony so that the crowd of people outside the prison would see him. People overwhelmed by seeing that Massoud Rajavi is safe, and they started throwing flowers at him. Then, the prison’s warden announced that since there was not much time left to the beginning of the martial law, the crowd should disperse and open the way for the last group of prisoners to walk out. The crowd cried out and nobody moved. Everyone stayed in their place and no one moved. Later, when everyone was almost ready, Moussa (Khiabani) called everyone to the room at the end of Ward 8 where he always worked. “Is everyone ready?” Then he looked around at each and every one of us, one by one. He said, “Massoud Rajavi was busy and he could not personally come to speak to you before leaving. I am conveying his message. As you can see, we are getting freed. This is a gift from our people and the result of the sacrifices made, the blood spilled on the streets. So, we did not gain our freedom free… We are not leaving prison to go after our own comfortable lives. The form of our struggle might change, but the goal remains the same, freedom and liberation of our people. Until now, we were fighting for this cause inside prisons, and we paid its price by enduring various forms of pressure and torture. Tomorrow should be doing the same in society. Do not think that the difficult conditions will end by leaving prison. Outside here, fighting (for the cause) is going to be more difficult and would require greater sacrifices. Everyone was silent, gazing at Moussa and carefully listening to him. After a few hours, the gates of Qasr Prison were opened. Massoud and Ashraf Rajavi, Moussa Khiabani, and a number of other PMOI and Fedaii members walked out of prison and went directly to the Justice Ministry where people were holding a sit-in. The next morning, various groups of people went to the residence of Rezaii Family (A famous family in Iran, whom had lost several of their children to the Shah’s dictatorship, including Mehdi Rezaii, who was executed by the Shah’s SAVAK when he was only 19) to pay a visit to the freed political prisoners. They were followed by Ayatollah Taleghani and Medhi Bazargan on the next days who also went there and met with the MEK members. The area surrounding the prison was filled with excitement until midnight. Relatives and families of prisoners, as well as their comrades and acquaintances who had been waiting impatiently all night with chants of hail to Mujahedin-e Khalq (MEK), salutes to Fedaii, opened their arms to embrace 125 of the best children of this nation. Meanwhile, a large group of families of political prisoners were continuing their sit-in at the lawyers’ guild, waiting for their children.